You are using an old version of ASRock XFast LAN ! An upgrade to a new version of ASRock XFast LAN or cFosSpeed is recommended. We have additional information for you as a customer of ASRock motherboards ! We have additional information for you as a customer of ASUS motherboards ! We have additional information for you as a customer of Gigabyte motherboards ! We have additional information for you as a customer of MSI motherboards ! Special prices during Easter Sale until ! The cFosSpeed Status Windows display important statistics about your current Internet connection. You should choose the skin most useful to you, e.g. 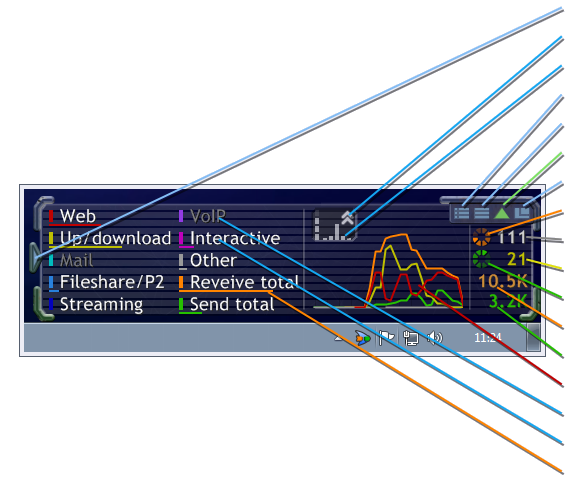 the icon skins which integrate into the task bar or the Traffic Analysis skin with real-time statistics about your current different traffic types. Please vote on the different skins. This will help us when designing the next skin window. The slot graphs show the current transfer rates as percentage of the maximum reached transfer rate since the last installation or calibration of cFosSpeed. The configuration of slots 1-10 (as a part of the cFosSpeed settings) can be accessed by either clicking on the Open slot configuration dialog button of the skin or using the Options/Settings menu entry of the systray icon. Each slot can be configured and renamed individually. The files background_color(_l).tga (in the same directory) can be modified to your needs by using a suitable graphics program. The transparent area of the images must not be changed.